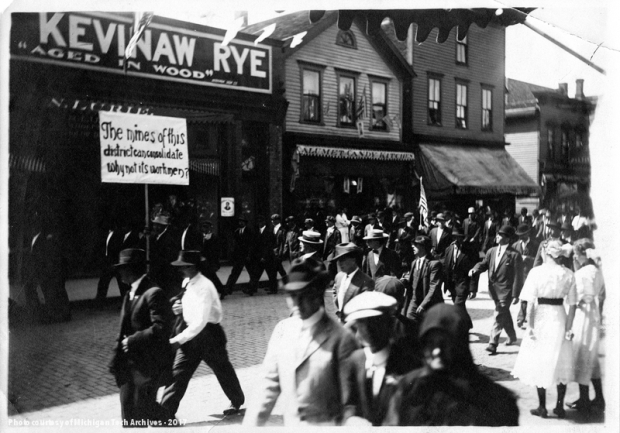 Supporters of the Western Federation of Miners parade through Calumet in a show of solidarity, July 1913. In July 1913, the Copper Country exploded. Frustration with pay, hours of work, and other grievances related to work in the mines had been fomenting for years, and the arrival of new technologies that threatened jobs–and the enrollment of many locals in the Western Federation of Miners–crystallized into a decision to strike. The powderkeg had been lit, and the communities of the Copper Country would forever bear the marks left as it burned. Whether a person sympathized with the strikers or the companies, communication at this time was absolutely essential. During the Western Federation of Miners copper strike, which endured until April 1914, a bevy of letters and telegrams on the labor dispute flowed from office to office and mailbox to mailbox. Many of them were lost before they could be preserved in any archives, but several gems mercifully remain, demonstrating the erupting tensions of the strike and the ingenuity of their authors in conveying a message. 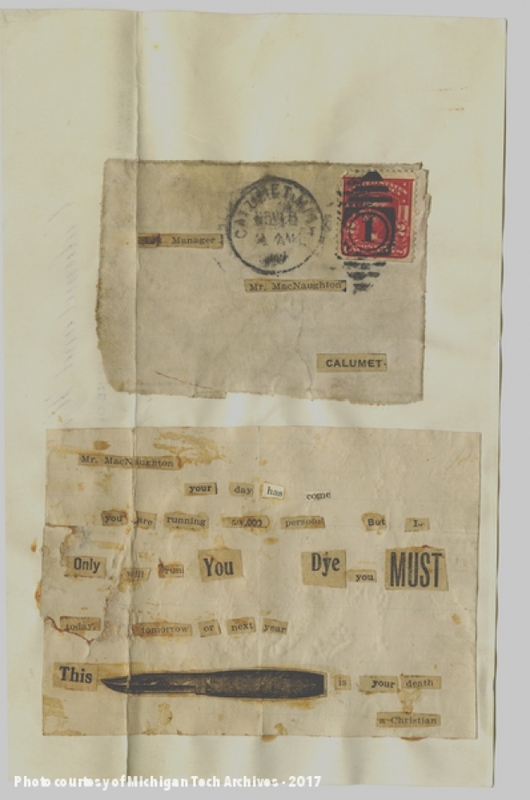 A threatening letter sent anonymously to James MacNaughton, presumably by a striking miner or union member. From MS-002, Calumet and Hecla Mining Companies Collection. Of course, MacNaughton and his compatriots had their own unique ways of communicating during the strike, as well. To our knowledge, none of the mine management group ended up sending union leaders images of knives, but plenty of biting commentary and plans to break the strike flew between the local offices of the Copper Country and company directors stationed in East Coast cities. Given the sensitivity of the information and the magnitude of what mine management believed to be at stake, they relied upon their very own code to ensure privacy. This secret language could be read easily by men like MacNaughton, who kept the master cipher, but would appear as gibberish to a person who intercepted the coded telegrams. 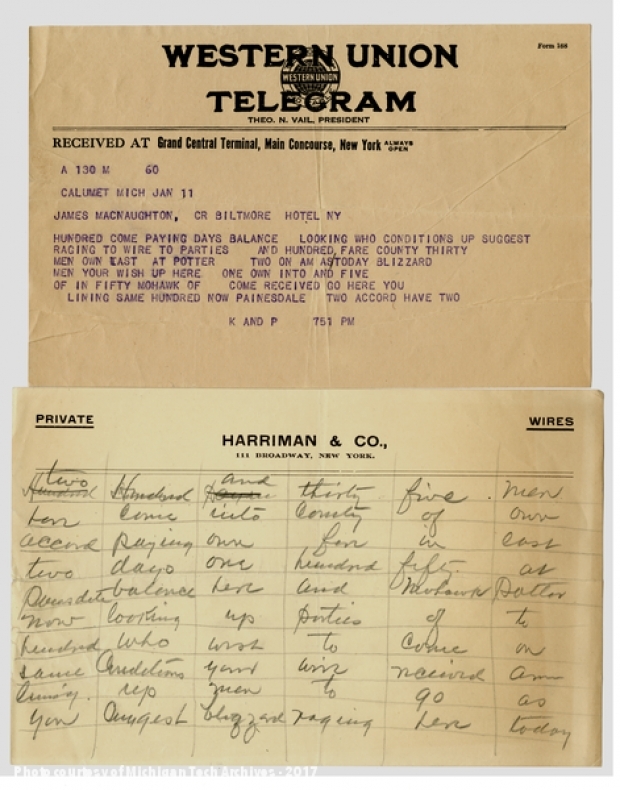 A coded telegram sent to Calumet & Hecla General Manager James MacNaughton, along with a rough translation. From MS-002, Calumet and Hecla Mining Companies Collection. In one such note, sent to MacNaughton while he was apparently in New York for the annual board of directors meeting, the general manager learned that “hundred come paying days balance… looking who conditions up suggest raging wire to parties and hundred fare county thirty men own cast at Potter.” To us–to almost everyone–it was as clear as mud. To MacNaughton, it was the beginning of an explanation that some 235 men had come to Houghton County on their own accord and paid their own fare for travel, not arriving as hired strikebreakers. Next time you send a message, no matter how trivial, take a moment to consider how easily your words fly across a distance and, most likely, without fear of interception. And please, unless you’re a fictional character in a murder mystery, don’t send anyone threatening letters cut from newspapers! Such timely advice from the writer! Our country is a powder keg again. Tensions are high and so are the stakes! I think it is wise that we must be more circumspect in out messaging. Rules of privacy are being challenged in ways that the strikers back then could never imagine. Unlike the letters that did not survive, the texts and blogs will last a long time. Thank you MTU archives for this wonderful feature of flash back Friday.